Title X, the nation's only family planning program, is being gutted by the Trump administration and the Department of Health and Human services. However, with the news cycle on hyperdrive, the threat to reproductive freedom was easy to miss amongst the other messages and calls to action. The Department of Reproductive Control was a campaign developed to cut through the noise. By creating a false government agency, we were able to raise awareness of the very real threats to reproductive health care. Every fact on the site, as well as in pre-roll and social-first video and social content, is true. The only change we made was to the name of the agency at work. The goals of the campaign were to raise awareness of what Title X is, as well as the administration's plans to dismantle it. 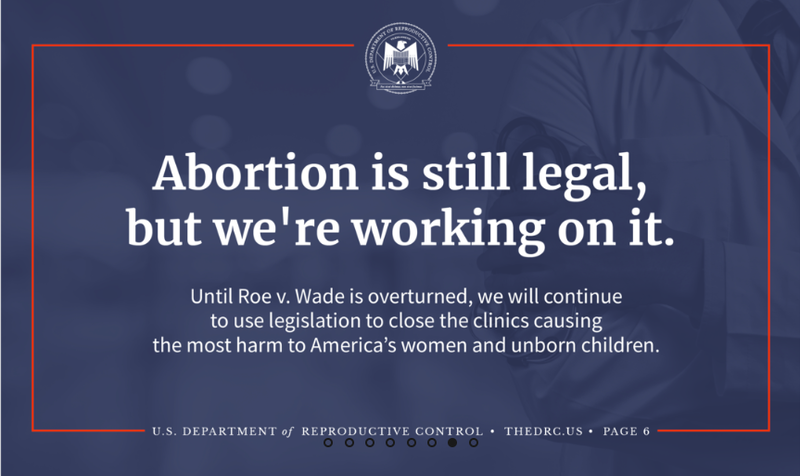 By posing as 'The Department of Reproductive Control' we were able to pull back the curtain on the family-values language often used to strip fundamental rights from vulnerable and low-income populations. For a two week campaign, we created over 100 social posts for optimized for Twitter, Instagram and Facebook including threads, slideshows and seven social-first videos. Action speaks louder than tweets - so each one of ours linked to a pre-written form users could edit and submit for official comment to the White House and the Federal Register.